Dashcams are becoming more and more popular in the United States. While law enforcement, taxi drivers and even fleet management companies have been using dash cams for years, the public use of dashcams became more and more popular overseas over the last few years. Now dashcams are making their way to the United States. Obviously safety is one of the most important reasons people use dashcams, but in a world where every moment creates an opportunity for video, dashcams are becoming part of that media creation as well. Dashcams are obviously great for insurance reasons. A camera with the ability to archive a recording when a sensor indicates you may be in an accident is definitely a feature you want to have if you get into an accident. During the crazy winter we all experienced this year, many people posted dash cam videos of other vehicles sliding, snow coming down and other weather related scenes. There are several dashcams on the market, the Papago GoSafe 330 happens to be one of the most feature packed dash cams with an affordable price tag. The GoSafe 330 relies on a microSD card so the amount of video footage that can be recorded is entirely up to the user. The GoSafe 330 records in five minute continuous intervals and when the card fills up it overwrites and starts over, very similar to most CCTV DVRs. At the same time though, a G-Sensor in the dash cam tells the camera when their may have been an accident or an emergency situation and that immediate video is archived and saved, so you always have the important stuff. The GoSafe 330 records in 1080p or 720p depending on the clarity the user wants and how much video they want to store on a particular card. 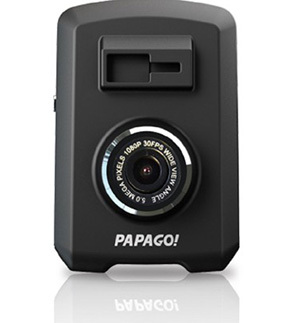 There’s a 2″ full color screen on the back of the Papago GoSafe 330 that lets you see what it sees and playback video. The Papago GoSafe 330 is actually a smart camera. It can alert you when it appears driver fatigue has set in. It can also alert you when headlights are necessary and even when you need to go because the car in front of you has gone. So while the camera is there in case you have an emergency situation, and can also help the user prevent those situations all together. Papago has even made sure that the GoSafe 330 can withstand extremely high temperatures and frigid cold temperatures. It can be mounted on a dashboard mount or on the windshield, both spots are extremely prone to high (and low) weather conditions). With all these features one of the best things has to be the price tag. You can get the Papago GoSafe 330 from Amazon for just $141.99 with Amazon Prime shipping.